You are here: Home > Author Pages > Beaton, M.C. VJ Books Presents M.C. Beaton! M.C. Beaton (aka Marion Chesney) was born in Glasgow, Scotland. She started her first job as a bookseller in charge of the fiction department at John Smith & Sons Ltd. While bookselling, by chance, she received an offer from the Scottish Daily Mail to review variety shows and quickly rose to become their theatre critic. She left Smith's to join Scottish Field magazine as a secretary in the advertising department, without any shorthand or typing experience, but quickly got the job of fashion editor instead. She then moved to the Scottish Daily Express where she reported mostly on crime. This was followed by a move to Fleet Street to the Daily Express where she became chief woman reporter. After marrying Harry Scott Gibbons and having a son, Charles, Marion moved to the United States where Harry had been offered the position of editor of the Oyster Bay Guardian. They subsequently moved to Virginia and Marion worked as a waitress in a greasy spoon in Alexandria while Harry washed the dishes. Both then got jobs at Rupert Murdoch's new tabloid, The Star, and moved to New York. Anxious to spend more time at home with her small son, Marion, supported by her husband, started to write Regency romances. After she had written close to 100, and had gotten fed up with the 1811 to 1820 period, she began to write detective stories under the pseudonym of M. C. Beaton. On a trip from the States to Sutherland on holiday, a course at a fishing school inspired the first Hamish Macbeth story. Marion and Harry returned to Britain and bought a croft house in Sutherland where Harry reared a flock of black sheep. When her son graduated, and both of his parents tired of the long commute to the north of Scotland, they moved to the Cotswolds, where Agatha Raisin was created. 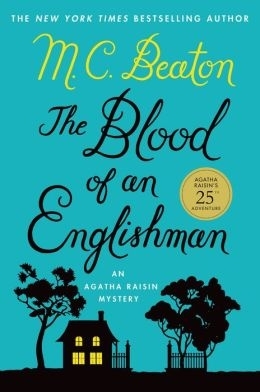 While Marion wrote her historical romances under her maiden name, Marion Chesney, as well as several pseudonyms (Helen Crampton, Ann Fairfax, Jennie Tremaine, and Charlotte Ward), because of her great success with mystery novels as M. C. Beaton, most of her publishers both in the U.S. and abroad use the M. C. Beaton pseudonym for all of her novels. ARC Book. February 2005 NY: Mysterious Press Advance reading copy, mint, new/unread in flawless pictorial wrappers. VJ Books Price $15.99 --> Why collect ADVANCE READING COPIES? 2001 NY: Mysterious Press Advance reading copy, mint, new/unread in pictorial wraps. VJ Books Price $16.99 --> Why collect ADVANCE READING COPIES? Advance Reading Copy 2008 NY: Grand Central Publishing Advance reading copy, mint, new/unread in flawless pictorial wraps. VJ Books Price $12.99 --> Why collect ADVANCE READING COPIES? Advance Reading Copy 2007 NY: Mysterious Press Advance reading copy, mint, new/unread in pictorial wraps. 2004 NY: Mysterious Press Advance reading copy, mint, new/unread in pictorial wraps. 2003 NY: Mysterious Press Advance reading copy, mint, new/unread in pictorial wraps. VJ Books Price $20.99 --> Why collect ADVANCE READING COPIES?